February 16, 2012 - Most airports are designed with circular roads so that cars driving through the airport belong in the airport. 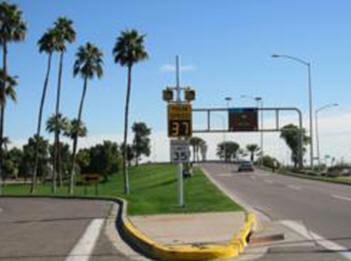 With high vehicle and foot traffic each day, monitoring traffic speed can be challenging for any airport. At Phoenix Sky Harbor International Airport, where the roads go from east to west instead of in a circle, this problem is an even more serious one. Cars often use the airport roads to get to their destinations despite the fact that their destinations are local. Vehicles looking to avoid freeway traffic cut through the airport, often at unsafe speeds, putting passengers, flight crews, and other vehicles at risk. In response to the airport speeding problem, the City of Phoenix decided to install radar speed signs to alert drivers and slow them down. The city issued a bid with the specifications they were looking for and Traffic Logix, a New York based manufacturer of radar speed signs and traffic calming solutions, was the successful bidder. Ed Faron, the Signage Program Manager for the City of Phoenix Aviation Department, was the one who wrote the initial sign specifications for the city bid. ?We knew exactly what we wanted,? said Mr. Faron, ?and I just love the Traffic Logix SafePace signs we purchased.? The SafePace 400 static ?Your Speed? signs purchased for the airport offer excellent visibility, easy programming, and an integrated strobe that can flash to warn speeding drivers. ?We?ve used other [radar] signs from other manufacturers,? said Mr. Faron, ?and we prefer the SafePace signs hands down.? The three SafePace signs have been installed at Phoenix Sky Harbor International Airport and Mr. Faron says they are pleased with the excellent functionality, the data collection capability and the Bluetooth feature that allows for quick and easy downloads. While information is still being gathered from the SafePace 400 radar signs, not enough data has been compiled to determine whether the signs are changing driver behavior. But one thing is clear. ?Overall,? said Mr. Faron, ?the SafePace signs are a pleasure to use. ?